July 1, 1907: What Was the Gas Mileage of the Horseless Carriage? 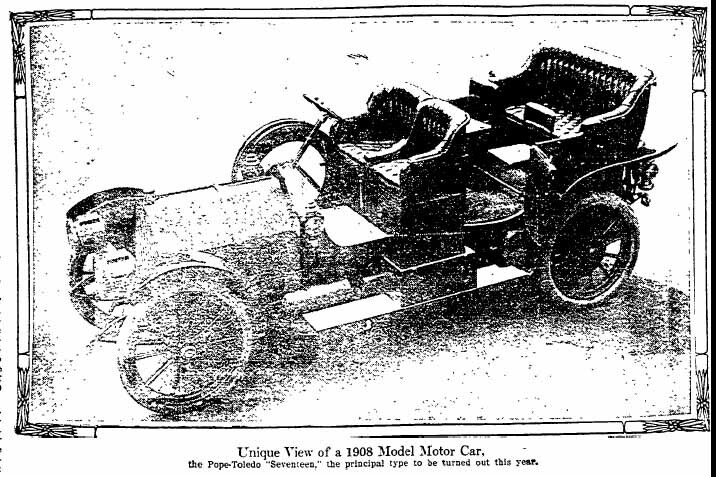 If you ever wondered if the Locomobile or Pope-Hartford got great gas mileage, the answer is no, as shown in the results of the 185-mile Lakeside Endurance Race. In cost and fuel efficiency, the 1907 automobiles were about the equivalent of a 2006 Ford Explorer (MSRP $31,650) or a Range Rover Sport (MSRP $56,085-$69,025). The car with best gas mileage in the economy competition was the Pope-Hartford, 8½ gallons (21.76 mpg), in the class of touring cars costing $1,501-$3,000 ($30,805.88-$61,570.71 USD 2005). Next was a Tourist auto, 8¾ gallons (21.14 mpg), competing in the class of touring cars with a price of $1,500 or less. Another Tourist won in the class for runabouts priced at $1,501-$3,000, 11 1/8 gallons (16.62 mpg). The winner in the class of touring cars costing more than $3,000 was an American, 11 gallons (16.81 mpg). The winner in the event for high-powered runabouts was a Simplex roadster, which covered 6 miles in 7:56 minutes, or a little over 47 mph. This entry was posted in 1907, Streetcars, Transportation and tagged #cars, 1907, automobiles, transportation. Bookmark the permalink. 2 Responses to July 1, 1907: What Was the Gas Mileage of the Horseless Carriage? Reliability rallies were once a popular pastime. The cars would be judged on MPG, oil burned/consumed, and least breakdowns over a set route. Automobiles were not always as dependable as they’ve evolved to be today. Absolutely right! They were very finicky in the old days. But there is very little hard data easily available.